This week’s Fabrication Assignment was based on using the laser cutter and measurements. This meant making precise measurements with and without the laser cutter using a variety of the tols we learned about in class. After some research and talking to some people I decided that the whole process would be a bit too labor intensive for the time allotted and my skills. 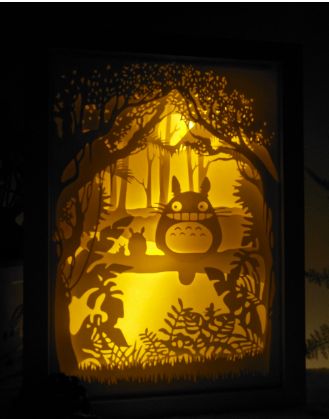 Once I had decided against the lampshade I decided to do a type of shadow box instead. The shadow box above was a sort of inspiration in my decision to try and make one. 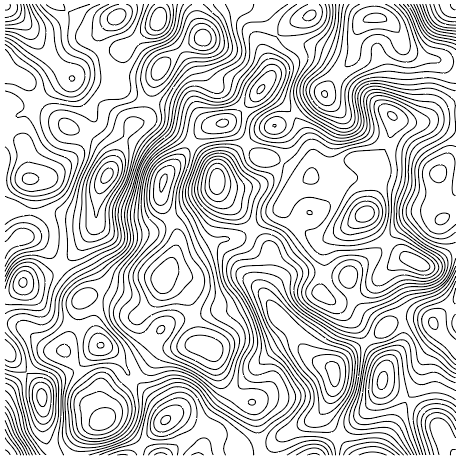 I really like topographic maps though so I wanted to make a shadow box with a topographic map design in it. I decided that using a combination of etching and cutting on acrylic in combination with mylar paper would create the effect that I wanted. In illustrator I designed this map to be etched and added a border of 5.44’’ x 5.49’’ to be cut so it would fit in a small box that I bought at the container store. I used the 50 watt laser cutter for this piece and set the laser to the recommended power and speed for the etching. The photo above is after the first go through with the laser. I ended up etching over the clear acrylic four times to get the depth and consistency in the pattern I wanted. Once over with the laser to cut and the piece was good. overall to cut this piece it took around an hour of time from start to finish. 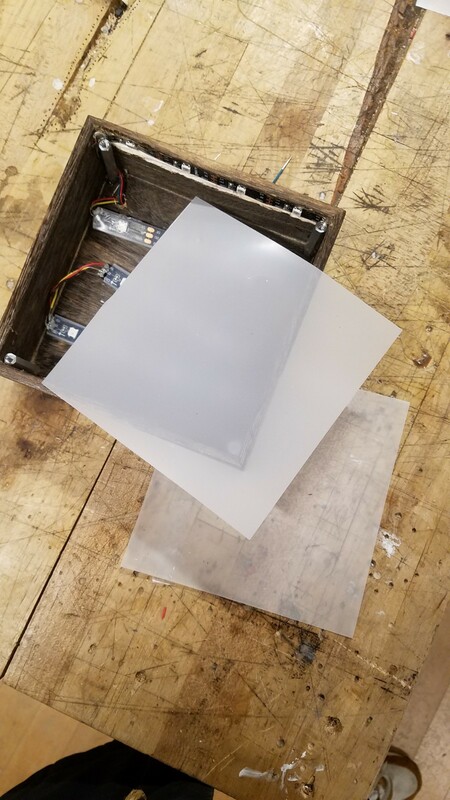 I added in a few strips of neopixel LEDs along the bottom of the box and then, using a utility knife and wood shaving tools, cut out a small divot in the side of the box to add one more led strip so I could shine lights through the side of the cut acrylic. I also added four standoffs to the corners to hold the map up. I measured and drilled small holes into each corner of the piece for the standoffs using a 1/8th drill bit. When drilling I put a bit too much pressure on the first hole and it cracked the corner of the piece but it was small enough where I didn’t mind the blemish too much. Using mylar paper I created a diffusing screen for the light that would fit beneath the glass. Above is an image of what the map would look like if a light was shown through the bottom of the acrylic map. 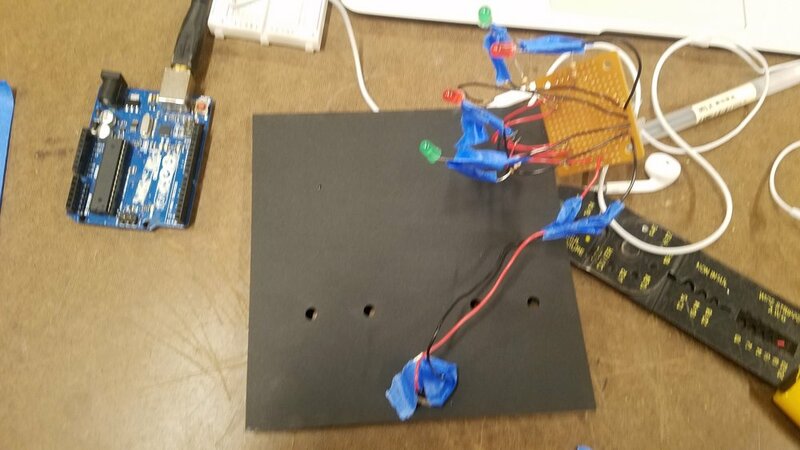 Unfortunately when I went to test the led strip none of the leds would work. After wiring up and testing an external strip and seeing that it worked fine I knew that me bending the strips in the box and messing around with the connections probably shorted them out in a few spots. As of right now I did not have the time to fix that so the box does not light up properly. 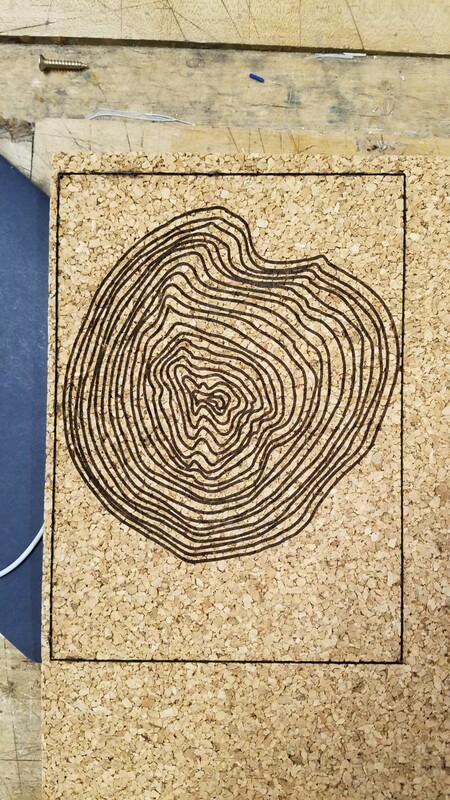 In terms of using the laser cutter and achieving the look that I was going for with the topographic map I was happy with how that turned out. On the other hand, I am not really happy with how the whole box and system looks. I am continuing to work on the lights and will hopefully be able to fix them soon. I would like to have more of a depth to the whole piece as well. Whether that means using wood to create that I’m not sure. 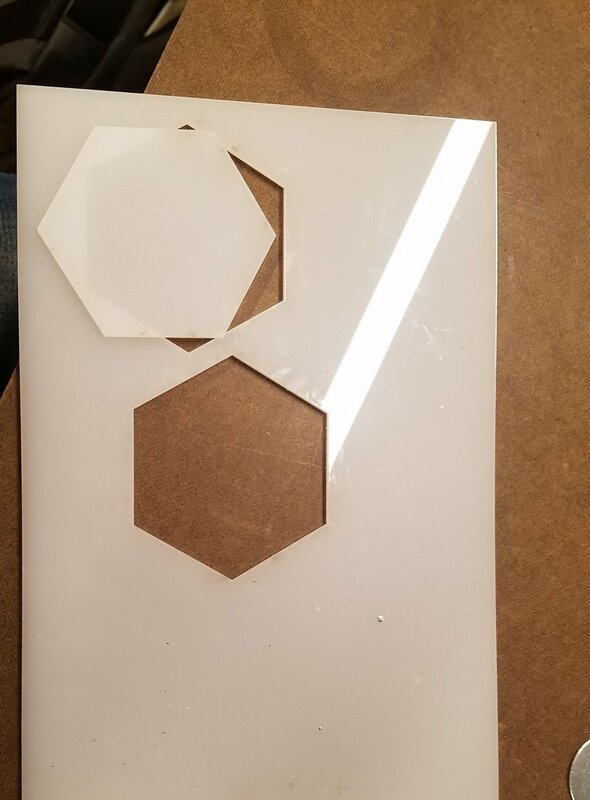 I also would like to come up with another solution for the led strip that is running along the edge of the acrylic piece. Finally I realized later on that I didn’t need to drill the holes in the acrylic for the standoffs as the acrylic sits in the box at a depth which I like. For this week’s assignment we needed to make five of the same thing. The goals were to focus on the overall process and repeatability. The project had to be multi-processed and more complex than just making five of the same figure on a laser cutter. I wanted to make something that I would find useful and would require me to use more than a few of the shop resources. Finally, I decided on making bookends. I have a lot of books at my apartment and three sets of bookends would be a nice touch for them. Purchase enough wood, the plan was to make six bookends since an odd number doesn’t necessarily make sense for them. Cut the wood into twelve, equal sized pieces. Stencil out the dowel holes for the connecting pieces. Sand the pieces and stain them. I was able to find a 6’ long piece of pine wood at home depot. the length made it perfect for cutting into twelve 6’’ pieces. Two pieces would make one bookend. After cutting the wood into the pieces I began working on figuring out what size dowel holes to make. It seemed like 1/4’’ would be the best for the size wood I had. I was excited to use the doweling jig to see how easily I could learn it. It turned out that it made drilling the dowel holes extremely easy and enjoyable and the 1/4’’ bit was the perfect dowel size. 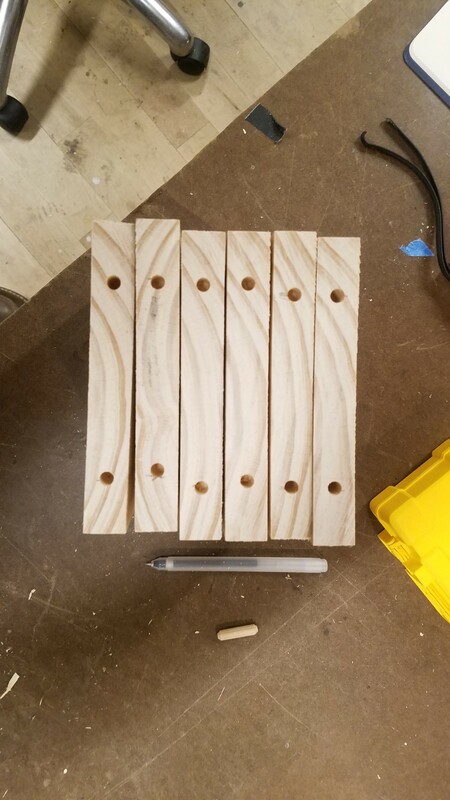 After drilling all of the dowel holes on the edges I realized that I was going to be careful when I went to drill the other dowel holes using the drill press. I measured out the opposite holes for the other half of each bookend and then used the 1/4’’ bit on the drill press to drill those holes. I found this to be much tougher than the doweling jig portion. The first hole I drilled with the Drill Press went straight through the back side of the wood. After a few tries I started to get the hang of it and eventually finished each piece. I was worried about the alignment of some of the dowel holes I had drilled. It turned out that I misaligned a few of the holes to the point where there was space on the back of the bookends and not a perfect edge. 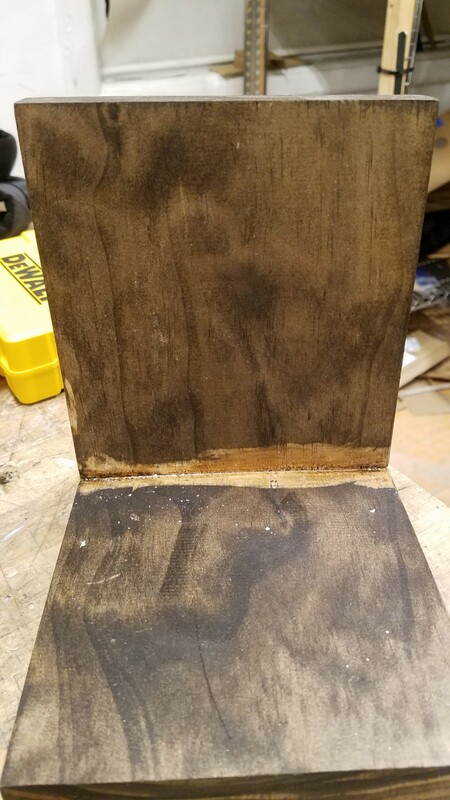 My solution for this was to still use continue with the dowel pins, then wood glue each piece together, and then finally sand each one of the backs down to the point where there was no excess wood. After a lot of sanding, and some accidental over sanding, I was able to get each bookend to a point I was happy with. At this point I was happy with the way each of the bookends was turning out. When I think of bookends I don’t think of light wood so a wood stain was added to each bookend. Before doing this I had no clue that residue from wood glue does not stain the same as the rest of the wood. As a result I was left with parts of each bookend that are significantly lighter in color than the rest. Once they dried I consider the pieces complete but, in my opinion, they are lacking something. Having all that empty space on each of them, I felt like I should have added something to them. So I decided to add an Edison filament lightbulb to the sixth one as a proof of concept for what the rest would look like with the same light. My process for adding the bulb involved drilling large hole in the base of the bookend and then using a small spade bit to make a divot down the bottom of the bookend so that the cord could be run through. This process was quick and dirty and had I thought about it more I would have gone through the process before staining and scheduled office hours to figure out how to drill the cord path without blowing out the bottom. Below are a few images of the final pieces!